Happy Halloween! Halloween, one of my favorite holidays, is right around the corner but have you had time to decorate your business or your home yet? If not, it's not a problem! Below are some quick and creative ideas I was able to find this year for you to utilize. Let me know how you do! 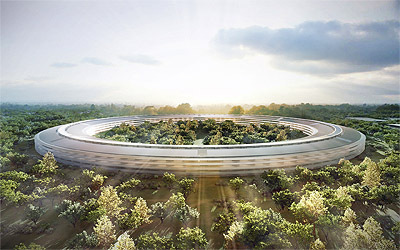 In our Green News corner, I am sharing images of the new Apple building designed to be built in Cupertino, CA. This was Steve Job's last creation before his tragic death. I hope you enjoy this October Newsletter! Feeling overwhelmed this year and don't have the time to decorate? No problem, I picked these ideas specifically for such busy people as us: entrepreneurs and business owners. If you missed our last newsletter on Suggestive Selling in Retail Environment, check it out HERE and HERE is How to Bring Happiness to Your Business Environment. 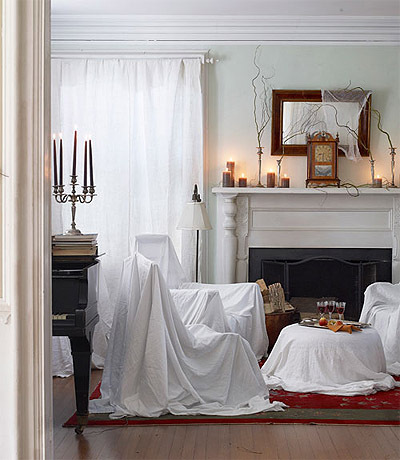 One of the fastest, simplest and cheapest ways to decorate this Halloween is to use your old white sheets to cover your furniture, chairs and tables. This trick can also be used in your office or your business space. Scattering dead tree branches, fake spider web and orange candles will complete your easy to create decor and take only maybe 20 minutes. Who has time to create a wreath this year? Not me! 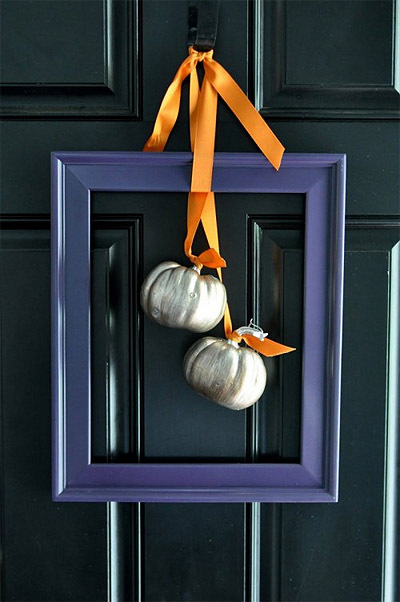 Here is another easy to create Halloween touch for your exterior door or for your windows. Find an old frame, tie it with a beautiful orange ribbon and attach a couple of little pumpkins at the center of the frame. Done! 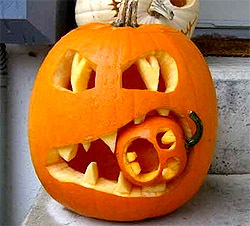 I love carving pumpkins but it can take so much time and energy! 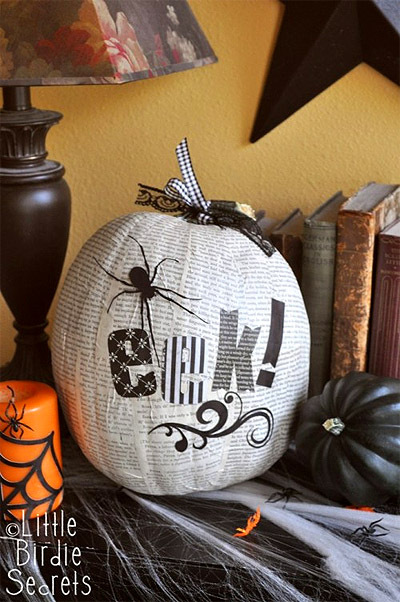 Why not paint your pumpkins or even better, cover them up with paper. In this case it's a simple newspaper: cheap and easy. Through some spiders on top of it for the eek effect! 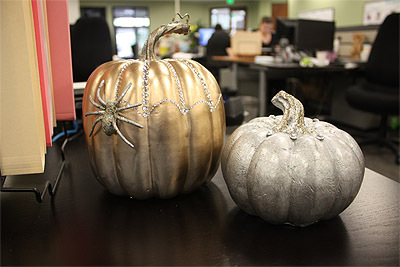 If you want to go fancy, paint your pumpkins in gold or silver paint like these jewels below. It would be a nice touch during Halloween party at your office this year. 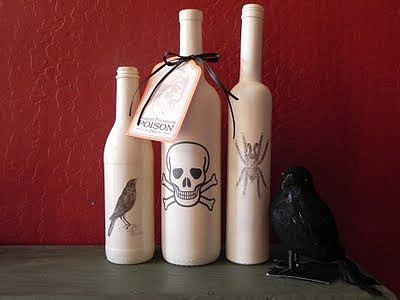 And finally, if you are having a Halloween Party at home and have nothing else to scare your guests with, how about some bottles with poison at your kitchen and bathrooms? Simply draw or print your images and put them on the outside. Paint the inside of an empty bottle with white paint. I hope these ideas will get you motivated and excited to do some decorations at your home or business this year in time and on a budget. During his last days, in August 2011, Steve Jobs was at the Cupertino City Council proposing a new campus building for Apple’s headquarters. The new building attracted a great deal of attention because of its shape (‘spaceship’ from the future) and the advanced technology involved in the design of the campus. Read more HERE. Ready for architectural changes in your business? Contact us HERE! 7 Steps To Shape Up Your Business Space! Copyright (C) 2010 Mindful Design Consulting. All rights reserved. Easy email marketing: design and build email newsletters with Tropos Design Group.